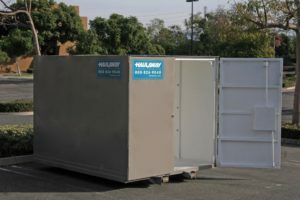 Perhaps you’re wondering, “Where can I find rental storage containers near me in Salt Lake City?” Although you might think it’s difficult to find the right company to work with, here at Haulaway Storage Containers we’re confident that we’re the best portable storage solution for you. Not only are we the best in the industry, but our Salt Lake City based location means it’s simple for us to deliver to you by the next business day. After more than 45 years in business, we’ve established a name and reputation for ourselves as reliable, punctual, and committed. We’re eager to share our expertise with all our clients to ensure a smooth and enjoyable rental process. Because we understand that everyone has different needs, we offer a variety of shipping container rentals in varying sizes such as 10’ or 40’. Not everyone needs 40 feet of space, but we offer this large size for our customers who can benefit from renting one storage container versus two or more. “Are the shipping container rentals near me guaranteed to be high quality?” With Haulaway Storage Containers, we say yes! All units are constructed from heavy duty 14-gauge steel and held to the highest standards in the industry. In addition, all our units are weatherproof, so you need not worry about your valuable keepsakes getting damaged in any way during their storage. For added peace of mind, several units come equipped with our patented Rhino Locking System to prevent theft. Ever since Haulaway Storage Containers was founded in 1968, we’ve consistently raised the bar in customer service standards. All containers are delivered according to a time and place that works best for your needs, not ours. And we make it easy for you to determine an appropriate budget with our handy free online request a quote. Getting the process started is simple – just give us a call today!